Comprising of approx 40 sq km, the Keibul Lamjao National Park is probably the world's only 'floating' sanctuary with deep vegetation. Visiting the place, one could see the distinguished features all around in the park. The park isn’t just about the vegetation and the terrain as you would also find the important highlight of the park which is the Loktak Lake that is considered to be the largest freshwater lake in India. The National Park is brimming with flora and fauna of motley species that live here in utmost harmony. To be very correct, there are nearly 233 species of aquatic plants, more than 400 species of animals and about a 100 varied species of birds in the national park. Also, the Keibul Lamjao is the home to endangered brow-antlered deer which is also known as Sangai by the locals in Manipur. To save the sangai deer the entire Loktak Lake was protected and declared a sanctuary in the year 1953 as it was threatened to get extinct. Later in the year 1954, following the re-discovery of the deer, the hunting was once again permitted in Loktak, except for a small portion at the southern tip, which continued to be protected. The area was later in the year 1966 was officially declared as a sanctuary and it was on March 28, 1977, the Keibul Lamjao National Park was created. 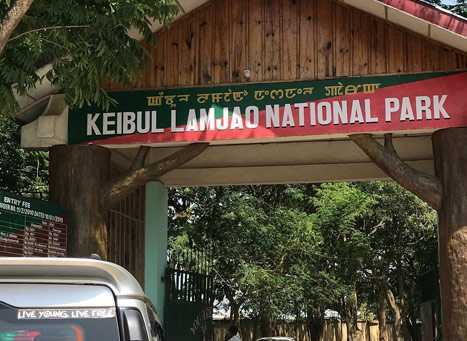 One could avail the public transport facility to make it to the Keibul Lamjao National Park when in Imphal. The Keibul Lamjao National Park can be visited all throughout the year depending on the rainfall conditions. Consider visiting the national park during the winter season between November and February to make the most out of your exploration in the park. Tourists can make a visit to the Keibul Lamjao National Park at any day of the week between 09:00 AM and 06:00 PM. There is no entry fees to Keibul Lamjao National Park.